DECON designs produces high-end, top quality and all weather Wicker Rattan Furniture that are aimed in giving much more than anyone would expect. DECON has always been inspired into bringing a much more exciting range of Wicker Rattan furniture products and designs that fit perfectly into individual houses, hotels, restaurants, resorts, beaches , cafes, gardens, offices and private Villas. DECON designs’ all Weather Wicker Rattan Furniture are Eco-friendly. All materials are recyclable and extremely long lasting. 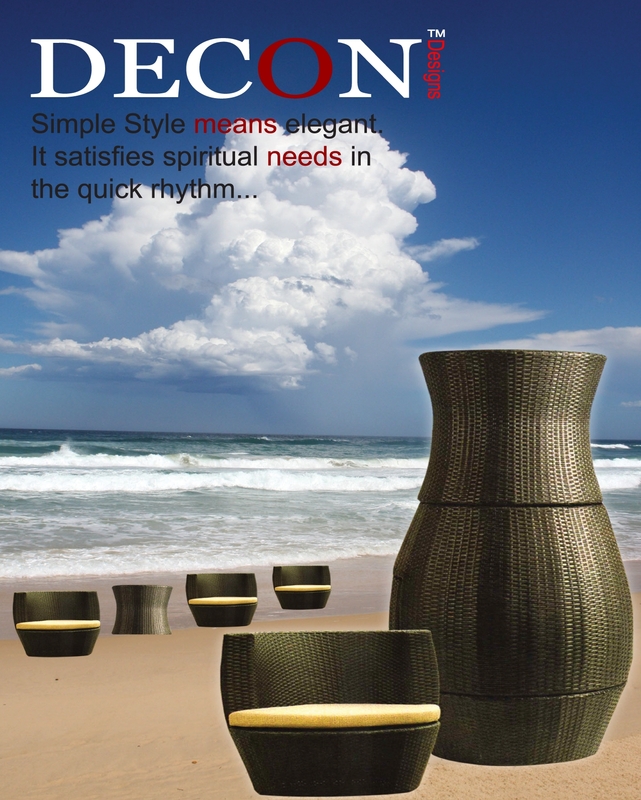 DECON offers many wicker collections that are Stunning and Sophisticated. It’s all about spending Quality time with friends and family and being comfortable while you do. DECON’s Patio Wicker Furniture can transform your backyard into a place where everyone will want to be. Through High Quality, Good faith, Continuous developing and design, humanistic services, we have obtained very good reputation of domestic and international customers. We are looking forward to establishing long-term reciprocal relationship with customers all over the world, and create a better living together! There are many styles of indoor and outdoor synthetic wicker rattan Dinning Sets, Sun Loungers, Swings ,umbrella’s, Trampoline, Outdoor Benches, Bamboo Screens, wicker Bar sets, Rattan Sofa Sets, wicker patio furniture sets including new ultra modern, contemporary and traditional models with a very wide range of weave patterns and colors to choose from. This makes it a great choice for many designers and home decorators as they can usually get just about any color and style needed to match a particular décor. Decon designs also provide furniture on rent in Malaysia. Decon meets your furniture needs for organising parties, get together, marriage functions, Ad and film shootings, corporate parties, Product launch ceremonies and much more functions. We meet the furniture needs of event management companies.